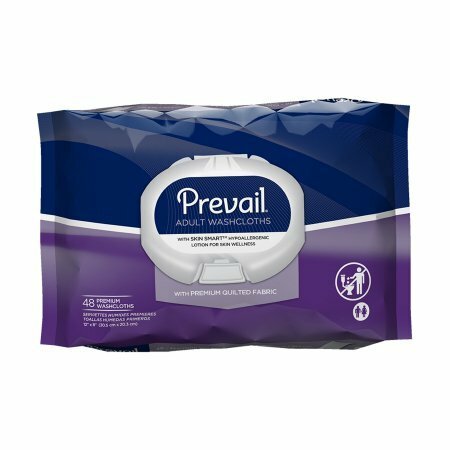 Prevail Premium Cotton Washcloths are a thick, super strong and super soft, cotton enhanced fabric; these washcloths are designed to be gentle on the skin and durable enough for tougher jobs. The Quilted Texture creates pockets for a more complete cleaning with overall less waste. With Single Hand Dispensing a single, unfolded washcloth dispenses for added convenience and less waste. Case includes 12 soft-packs of 48 wipes each. Quilted cotton naturally enhances the washcloth's thickness, strength and absorbency. Enhanced with lotion for improved skin health. Alcohol free, latex free and clinically tested. Convenient soft-pack with flip-top lid. Large 8 x 12 in. size ideal for incontinence care. If you have any questions about this product by Prevail, contact us by completing and submitting the form below. If you are looking for a specif part number, please include it with your message.